I’ve always been a fan of Plumb. Her music is in my main playlist of Christian Contemporary artists. In My Arms is actually one of my favorite songs by her. It just gives me chills whenever I hear it. Of course when I had the recent opportunity to listen to her newly released CD, Exhale, I was beyond thrilled. 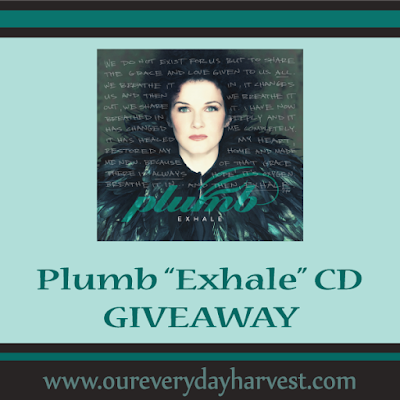 Exhale is the seventh studio album from acclaimed multi-genre singer, songwriter and author Plumb, expresses a new focus and vision. After the runaway success of Need You Now (the album, title track and book), which coincided with her own moving story of brokenness and ultimately healing, Exhale brims with worshipful songs of gratitude and hope. The title comes from something my pastor said recently: “We do not exist for us….we exist to share the grace and love so freely given to us all….we breathe it in, it change us, it makes us new and then we share it – we EXHALE.” I breathed in a life-changing grace when God met me in my darkest place of brokenness after my husband left me, and He change me and gave me hope. Then, He redeemed a dead marriage in a way only He could…through a miracle… and we remarried. I am SO THANKFUL for the redemption. SO THANKFUL for that change. SO THANKFUL for that grace. So I made this new record as one huge, gigantic love letter to the One who carried me during all of that. 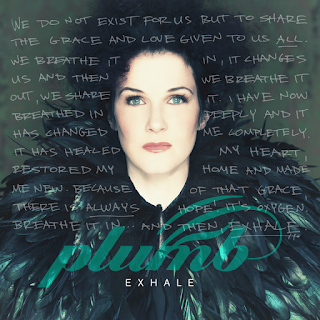 EXHALE represents the hope of the entire record…that we will each breathe in that grace and then exhale it. That is why we exist! The music on the CD can be summed up as a pleasant Christian Contemporary mix of pop, electronica, and soft rock. It’s kind of difficult to choose a favorite song from this CD, but I especially enjoy track number 6, My True Love, which offers a hip upbeat tempo that gets me going. Track number 10, Sleep Will Be Sweet, is another favorite of mine. I really enjoy the passion and rhythm in this song. 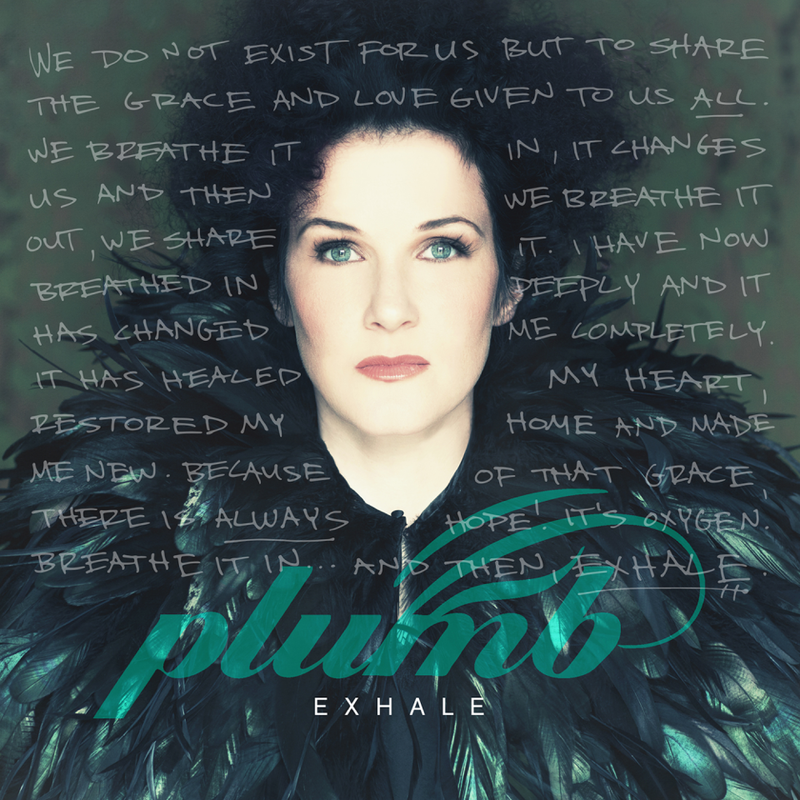 There is real power in Plumb’s melodic voice. She meant for this CD to be a “gigantic love letter” to the Lord who helped her through a time of hardship, and you can definitely feel that emotion throughout each track on the CD. We all go through trials and tribulations at various points in our lives. Exhale is an incredible testimony to how great the Lord is. I truly believe music can be wonderful food for the soul. The lyrics are beautifully written with positivity, encouragement, and hope. This really serves as an uplifting reminder that God is always there for us, no matter what. Track number 8, Faithful, is a perfect example of this. As usual, Plumb does not disappoint with her newest collection of music. Her voice has always been amazing and it still is. The lyrics to each song on the CD are extremely captivating. Exhale has just made its debut release on May 4, 2015. The entire Exhale Deluxe CD is available on iTunes for purchase. For more information and tour dates, you can also visit Plumb online. Don't forget to scroll down to the bottom of the main homepage to sign up for the Official Plumb Newsletter and receive a free download. I’ve also been presented with a wonderful opportunity to host a giveaway for Our Everyday Harvest readers. One winner will receive their very own CD copy of Plumb’s Exhale, so they can also enjoy this beautiful collection of music.